Chemically bonded, sometimes called bonded nonwovens or binding web. This is the achieving of the adhesion or bonding of fibres by chemical means. This can take place by cohesion or adhesion. 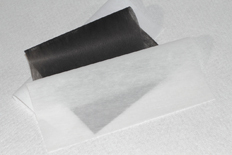 Using a cohesive bonding for nonwovens, the fibre material is treated with chemicals. The top fibre surface is thus dissolved and the fibres underneath can then bond with each other. When using an adhesive bonding of fibrous nonwovens by chemical bonding agents, synthetic bonders such as elastomers and plastomers are used. These are applied to the fibrous nonwovens using various methods, for example using liquid impregnation, foam impregnation, spray bonding or imprinting. Additional processes are mostly necessary in order to change the properties further.